The OPM 1 oil content alarm was specifically designed for the control of 15 ppm marine bilge oil separators and fully conforms to the requirements of IMO Resolution A393(X), and MEPC 60/33. 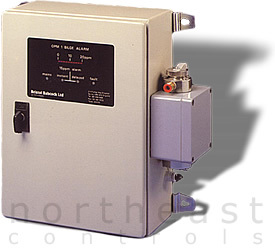 The design results from extensive experience in the development of oil content meters and makes use of advanced techniques and components. The actual concentration is displayed on a multi element LED bargraph display and facilities are provided for a remote recorder and alarm indication. The sample flows through a cylindrical glass cell through which a low intensity beam of infrared radiation is projected. Two silicon photodetectors are provided to detect and scattered path of radiation by the oil particles. The angles and field of view of the detectors have been carefully selected to provide high sensitivity to oil and very low sensitivity to solids which may be present in the sample. This, coupled with the wavelength of light chosen, ensures minimal sensitivity to water colour and other soluble components, and is inherently self compensating for window fouling, mains voltage variation, and changes in ambient or sample temperatures. Indication of oil concentration is provided by the 10 element bargraph display which provides accurate indication for a range of 20 ppm. Two alarm relays are provided, both factory set to operate at 15ppm. One is arranged to operate immediately the 15 ppm level is exceeded, while the other is provided with a delayed reaction. The operating state of each relay is indicated by solid state indicators on the door of the instrument. Additional and similar indication is also provided for Mains On and Equipment Fault. This unit should be installed as close as practicable to the sampling point. Access is only required to the top of the cell housing, and front of the instrument. The connection requirements should closely follow the installation diagram. Little maintenance is required and is confined to a periodic check of zero against clean water and occasional cleaning of the glass sample cell, which is mounted in a cell box fixed to the side of the main instrument case. Access to the inside of the cell is provided by a hand-tightened screw cap, which enables insertion of a tube cleaning brush. No dismantling is involved.